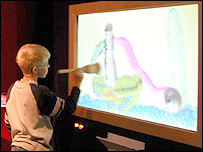 " The device allows children to pick up colours and textures from their environment and paint with them on a large digital screen." I dunno how flexible it would be in terms of serious painting, but I'd still want to give this a try. that looks fun actually. But more like a toy then anything else. It's supposed to be a toy. Very cool! no its extremely cool! a real life color picker and a screen bigger than the biggest apple cinema display! separate from that, its a really nice practical research project that might help change how people work.